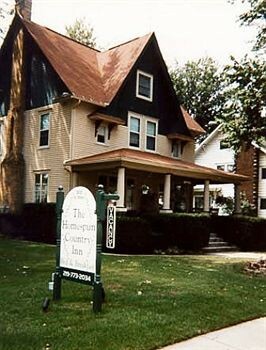 Property Location You&apos;ll be in the historical district with a stay at The Homespun Country Inn in Nappanee.Rooms Make yourself at home in one of the air-conditioned rooms featuring DVD players. Complimentary wireless Internet access keeps you connected, and cable programming is available for your entertainment. Bathrooms have showers and complimentary toiletries. Conveniences include ceiling fans and irons/ironing boards, and housekeeping is provided daily.Rec, Spa, Premium Amenities Make use of convenient amenities such as complimentary wireless Internet access, concierge services, and gift shops/newsstands. Additional features include a television in the lobby and tour/ticket assistance.Dining Grab a bite from a snack bar/deli serving guests of The Homespun Country Inn.Business, Other Amenities Featured amenities include complimentary newspapers in the lobby and coffee/tea in the lobby. Free self parking is available onsite.